As an importer and distributor, we specialize in Manual Lathes and have been providing the industry with high quality European Engine Lathes at affordable prices for over 40 years. European built to high quality machining standards, LION Engine Lathes are designed to embody the ideal combination of heavy duty construction, rigidity, accuracy, and reliability to meet your most demanding machining requirements. Our engine lathe models feature heavy duty bed construction with extra wide bedways and heavy machine weights. All LION Lathes are designed with heavy duty clutched headstocks with hardened and ground gears, which provide the user with ample rigidity for effortless cutting. Spindles feature world renowned SKF bearings, resulting in high accuracy. 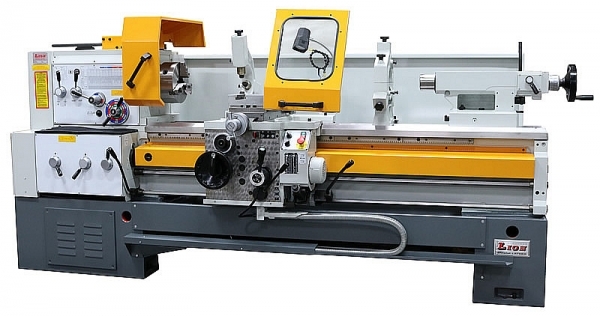 LION Lathes provide capability and versatility with a wide array of standard machining features such as 4-way rapid traverse, inch & metric threading without change of gear, a wide variety of threads and feeds, and large spindle bores. With all these features and more, LION is "the complete lathe". We specialize in supplying manual engine lathes and stock more than 70 machines in our inventory. We offer engine lathe sizes from 16" x 40" to 40" x 240". Many of our lathe models are equipped with large 4" spindle bores, and some models go up to 6" bores. LION Engine Lathes feature heavy duty bed construction with wide bedways and heavy weights for maximum stability. All lathe models are designed with heavy duty geared and clutched headstocks for rigidity and effortless cutting. All of our lathes cut inch & metric threads without change of gear. All lathes come standard with a simple “feed joystick" and 4-way rapid traverse. We stock spare parts and accessories for all models (if needed).